Sunday I was signed up for the Chase vans that were going to track down various rarities and hard-to-locate birds that had turned up throughout the week. There were three target birds–Rose-throated Becard, Hook-billed Kite, and Black-vented Oriole; each with a different van. 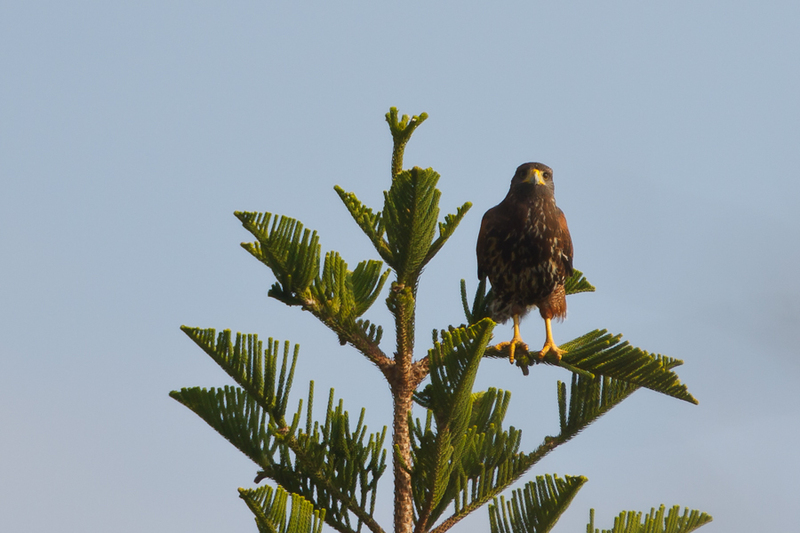 Hook-billed Kite is local but tough to find. 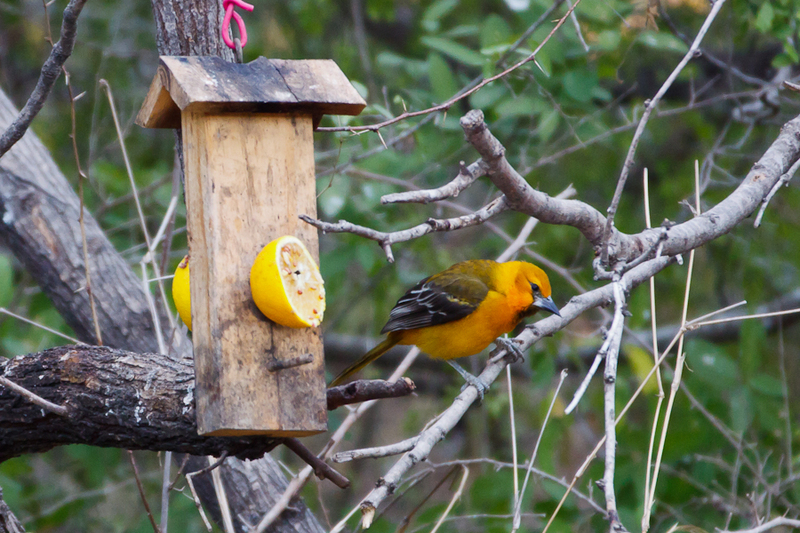 The Black-vented Oriole had not been seen since before the Festival started, and I’d already been to Bentsen where it was believed to be hanging out if it was still around at all. However the Rose-throated Becard is a Mexican rarity, and was at Estero Llano Grande State Park. Since I’d only been able to spend about 45 minutes here on the Big Day at the beginning of the festival, and since it also offered a shot at Common Pauraque and Green-tailed Towhee, I picked that van. You can see how this bird might be a little hard to find. 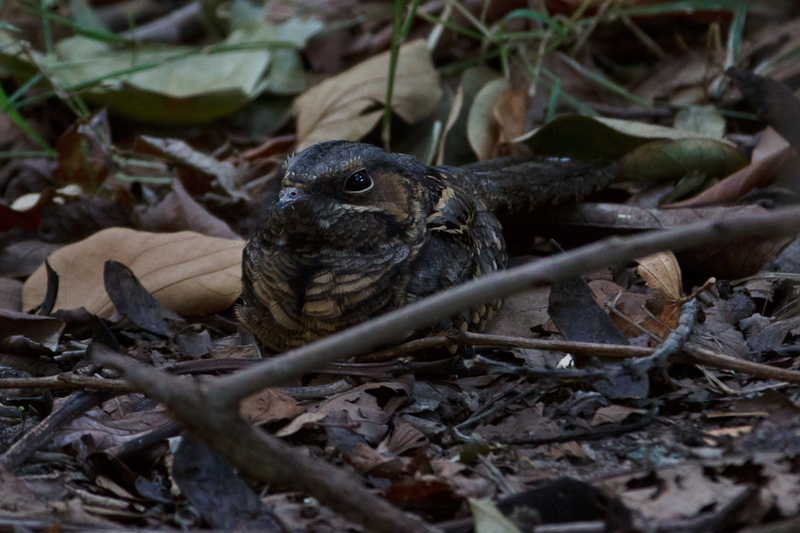 These nocturnal birds sit motionless and noiseless in the leaf litter all day, relying on their incredibly cryptic coloration to camouflage them. Saturday, I took another leisurely (only six hours) trip south to the border. The attraction this time was access to the Nature Conservancy’s Southmost Preserve, a site not normally open to the public. This is next door to Sabal Palms and shares a lot of the fauna with that site. However we did get several new species for the trip, mostly as flyovers including Snow Goose, Ross’s Goose, Greater White-fronted Goose (which I initially mistook as a life bird–I don’t know why I never remember that I’ve seen this one before. I’ve tallied it as a lifer multiple times in multiple states. Somehow it’s just really forgettable.) and #796 Chihuahuan Raven. I wad the 50mm lens on my camera when the flock flew over (I was practicing digiscoping) so no pictures. Basically it looks like a crow, or a raven; but there are no other crows or ravens around here so a flock of 24 large black birds bigger than Grackles pretty much has to be Chihuahuan Raven, though if one were side-by-side with a Common Raven I’d be hard-pressed to tell them apart. Today I signed up for a special trip with Jon Dunn. Jon’s a great birder and a fun guy (and also co-author of the National Geographic Field Guide to the Birds) but we did visit a strict subset of the sites I had visited the day before with Greg Miller on the Big Day so I didn’t find too many new birds; and only one was a life bird, #792 Painted Bunting. It was a female, and I only saw it for about a second and a half, so no photo. 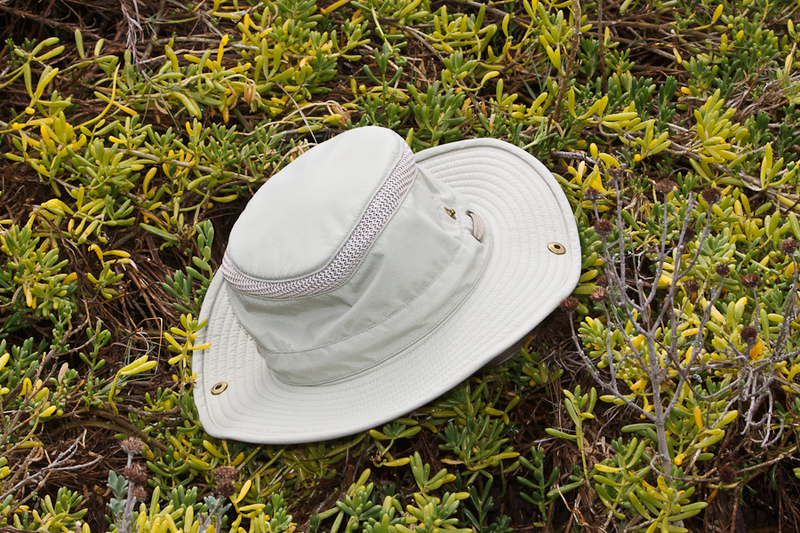 I was going to leave the hat there, but a fellow birder was braver than me and climbed off the boardwalk, into the swamp, ignoring the “Beware of Alligator” signs, to retrieve it. It wasn’t just me either. Jon lost his hat once too. I also managed to miss, once again, Green-tailed Towhee. Jon and some other group members found it, but I did not. It’s turning into this trip’s nemesis bird. 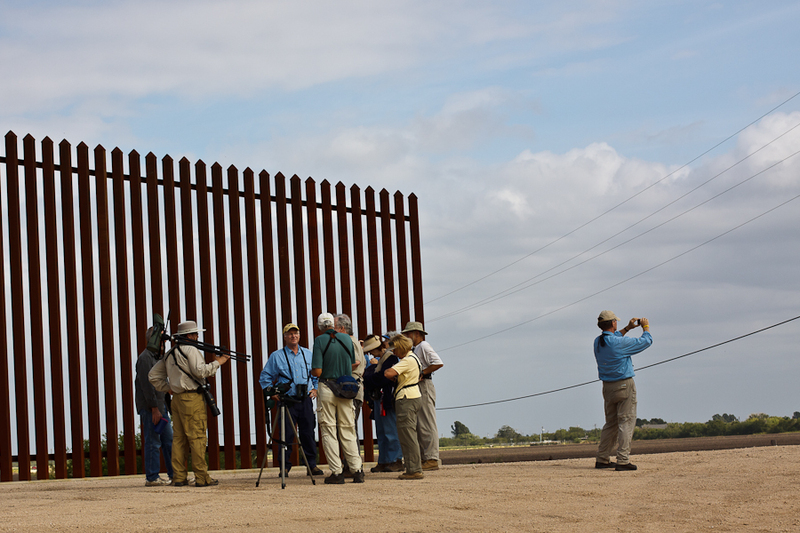 Today started the Rio Grande Valley Birding Festival. I signed up for the Big Day vans to chase as many species as possible. As big days go this wasn’t the largest–we didn’t start till a little after 6:00 AM and finished around 4:15 PM; but we did rack up about 125 species including nine life birds. I squeezed into a van with Greg Miller of Big Year fame and Matt Denton from BirdQuest. We left Harlingen around 6:05 AM and headed down Highway 100 to South Padre Island, adding a few hawks along the way. However, the real counting didn’t begin until we got to the South Padre Island Convention Center, where we tallied more than 60 species including my first life bird of the day, #785, Franklin’s Gull. This was a good one. I’d missed it by a few hours in Port Aransas earlier in the year, and I don’t think it was seen at all later in the week. Next stop was a small patch of protected land in the middle of a residential and hotel area on Sheepshead Road. (LTC 036 on eBird). 16 species here including a rare Pine Siskin. However I missed potential life bird Green-tailed Towhee that Greg Miller spotted. This would become a common theme throughout the week as I repeatedly missed the Green-tailed Towhee at multiple sites. We also found a not-really-countable Aplomado Falcon. (The species has been reintroduced in Texas after being extirpated around 1951.) However I’d seen that in Panama a few weeks before at El Chirru, so it wasn’t as big a deal for me as for some other participants. You are currently browsing the Mokka mit Schlag weblog archives for November, 2011.